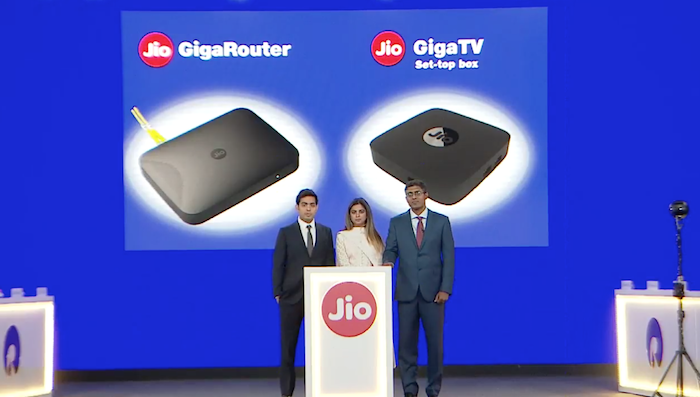 Jio GigaFiber : Reliance Jio has announced a bunch of products including JioPhone 2, GigaRouter, GigaTv set-up box and JioGigaFiber. The company has also announced that YouTube, Facebook and WhatsApp are coming to the JioPhone. The next version of the JioPhone will go on sale from 15 August at a price tag of Rs 2,999. Reliance Industries (RIL) has announced the long-awaited Fiber-to-the-Home (FTTH) broadband service 'Jio GigaFiber' in its 41st Annual General Meeting (AGM). The company plans to launch a fixed line broadband service in 1,100 cities and, according to the claim, the world's largest fixed line will be broadband rollout. This will revolutionize TV and mobile world. Jio GigaFiber will be set-top box for TV with broadband. There will also be an enabled voice command feature and calling facility for the TV. The company plans to provide 1,100 city homes, merchants, small and medium enterprises as well as fiber connectivity to large businesses. Fixed line Fiber Broadband service will revolutionize people watching TV and your homes will become more 'smart'. Jio GigaFiber will increase the speed of the internet. Which will be found in gigabytes every second. This service will allow viewers to see over 600 TV channels. Thousands of movies and millions of songs will be able to see and hear. This will make people realize the theater at home. Geo Gigabeefber can also make a voice call from TV to TV. Jio Phone 2 @ Rs. 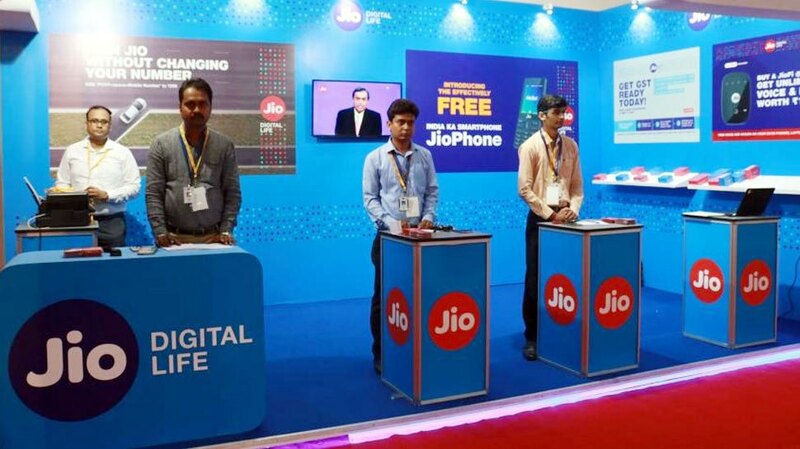 2,999: Reliance Jio has announced a bunch of products including JioPhone 2, GigaRouter, GigaTv set-up box and JioGigaFiber. The company has also announced that YouTube, Facebook and WhatsApp are coming to the JioPhone. The next version of the JioPhone will go on sale from 15 August at a price tag of Rs 2,999. The phone will feature horizontal screen display and full keypad and will be powered by KaiOS. The company recently received an investment of over $22 million by Google. Before that, RIL had acquired a stake of 16% in the company for over $7 million in March this year. 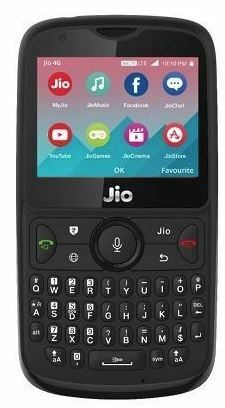 Reliance Jio Phone 2, an upgraded version of the popular Jio Phone, has a QWERTY keypad, supports dual SIM cards, VoLTE and runs on KaiOS operating system. The smart feature phone comes with 512MB of RAM and 4GB of ROM. Jio Phone 2 has a basic 2 MP rear camera and VGA front-facing camera for selfies. The three most popular apps YouTube, WhatsApp and Facebook will be available to all the JioPhone users from 15 August. Jio Rs 149 get 3GB data per day: After updating Airtel's 149 and Rs 399, Reliance Jio has updated every pre-paid plan of Airtel on a major attack. Reliance Jio has launched the cheapest plan of the Indian telecom market so far. Geo will now give 3 GB of data per day at Rs 149. So what are these guys about this complete plan? Reliance's 149, 349, 399 and 499 rupees will now get 3 GB of data every day. Earlier, each of these plans received 1.5 GB of data per day. The validity of this plan will be 28, 70, 84 and 91 days respectively. Apart from this, plans of 198, 398, 448 and 498 will now get 3.5 GB of data every day. Earlier this plan was getting 2 GB of data every day. The validity of this plan will be 28, 70, 84 and 91 days respectively. 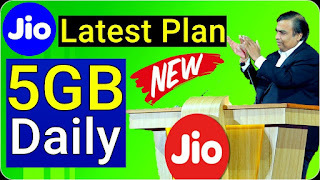 “In response to the Airtel offer, Jio will now provide 1.5GB/day additional Jio 4G data to EVERY JIO USER who recharges with any daily-recurring data pack,” Reliance Jio said in a statement. 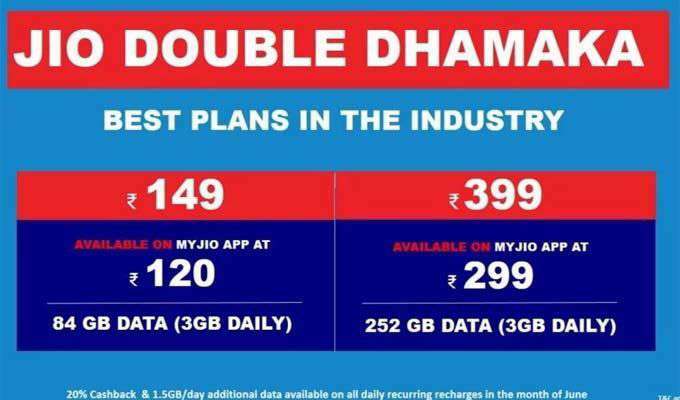 To sum up the revised offer, the Jio Rs 149 get 3GB data per day effectively comes for Rs 120 with 3GB/day data, free voice, SMS and Jio Apps for 28 days while the Rs 399 pack effectively comes for Rs 299 with 3GB/day data, free voice, SMS and Jio Apps for 84 days. Additionally, Jio also offers a Rs 100 discount on all recharges of Rs 300 and above and 20 percent on recharges below the Rs 300 price point, if the user recharges through the MyJio app and pays using PhonePe wallet. How to extend your Jio Prime Membership for free: Existing Jio Prime Members: Jio had confirmed that all existing Jio Prime Membership holders would get a free renewal for another year of Jio Prime Membership without paying a single rupee. However, the user will need to do certain steps to avail this offer. To avail the free extension, all existing Jio Prime members will need to install the official My Jio application after downloading it either from the Google Play Store or the Apple App Store. Once you are logged in, you should be able to see a prompt asking you to extend the Prime Membership. 1. Existing Jio Prime members can avail the extension via My Jio app. In case, you don't have the app download it on your device. 4. On hitting Get now, MyJio app will take existing Prime members to the next page that says "Jio Prime is getting bigger, you are a valued Jio Prime member. And we are extending one full year's subscription absolutely free for you." This particular page will have all you Jio numbers listed which will mean that you can extend one year Jio Prime subscription for multiple Jio numbers. RELIANCE JIO has released a career notification for the Graduate candidates regarding hiring of Fresher on a handsome pay roll. Reliance Jio has started providing mobile telephony, 4G services and various digital services in India. The aspirants who are seeking for a remarkable job opportunity should apply for RELIANCE JIO Recruitment 2018. The company has recently launched this project however working for many years. Reliance needs energetic & fresher candidates who can run project efficiently. The job seekers who are full of confidence can apply for reputed company of the world by submitting an online application form before the closing date. All interested candidates are require to check eligibility details for RELIANCE JIO Recruitment in mentioned advertisement as below. Qualification: - Applicants for Jio Recruitment 2018 should have completed Any Graduate/Post Graduate in any discipline to entry level for Freshers for Jio Recruitment 2018. Eligible & Interested candidates can download the application in Official website page in www.jio.com Jio Recruitment 2018. At first, login to Reliance Jio Website. i.e. 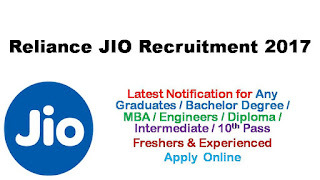 www.careers.jio.com. On the home page click on the relevant jobs. Reliance Jio Infocomm (Jio) has revised its tariff plans for the second time in two weeks, offering 500 Mb more data at the same price points, saying it was bettering bitter rival Bharti Airtel's recent offers, underlining the continuing tariff war which will hurt average revenue per user further. Reliance Jio's Daily 1GB 4G Data Plan Will Be Available Just Rs. 4 only Reliance Jio has begun to make one more hit in the new year. According to sources, according to the Happy New Year 2018 offer, daily price of 1 GB data plan has been reduced by up to Rs 60. Following the recent reduction, the price of 1 GB daily 4G data of Rs.199 will be available to customers in only Rs. 149. Interestingly, after the change in tariff, the recharge packs will be available at the same rate at the same time as before October. In addition to cheaper geo prepaid packs, the company will also launch several new plans of daily 1.5GB data. This change in tariff and new plan will be applicable on Tuesday. The company will also launch many such plans and offers in the coming days. Today, the Geo Plan of Rs.199, 399, 459 and 499 will now get customers Rs. 149,349,399 and 449 respectively. There will be no change in the free voice calls and free SMS facility available in the plan. It has not been clarified yet how long the recharge packs will be available at affordable prices. There is a possibility of clarification on Tuesday. Surprising cashback offer for geo users is already available. Geo has around 16 million customers in India. After the launch of Geo, firm competition has started among the telecom sector firms. New Delhi: Reliance Jio will provide "surprise cashback" of up to Rs 3,300 on recharges of Rs 399 and above, effective on recharges before January 15, 2018, according to industry sources. This cashback will be in the form of Rs 400 MyJio cashback vouchers, up to Rs 300 instant cashback vouchers from wallets and up to Rs 2,600 discount vouchers from e-commerce players. This plan is valid for 28 days and offers pre-paid customers 1.2 GB of high speed data per day, unlimited SMS, unlimited voice calling and a subscription to Premium Jio apps for all Jio Prime members. Most of Jio's plans offer 1 GB of high-speed data per day, so this plan offers 20 percent more data per day. The cheaper Rs 149 plan with 28-days validity is still available, but it offers a relatively meagre 0.15 GB of data per day, making the Rs 199 plan a much better value proposition. This plan offers 2 GB of high-speed data per day, unlimited SMS, voice and access to Premium Jio apps for all Jio Prime members. Post the free, high-speed data limit, bandwidth will be throttled to 128 Kbps. The only other prepaid plans offering more data are the Rs 509 and Rs 799 plans, which offer 2 GB data per day and 3 GB data per day for 49 days and 28 days respectively. Reliance Jio has resumed booking of its 4G feature phone. The news agency said through sources that the people who are currently interested in buying Geo phones can now be booking. According to sources, the company has sent a message to potential customers, who have expressed opinions about buying this phone. According to a channel partner of JIO, who has also sent a link to 500 people who have submitted the request for booking, the link has been sent. Then they are told about the date of the JIO phone. It is worth mentioning that nearly one crore people in July expressed interest in buying a Geo phone. A message from the company has been sent to these people. However, the company has not yet provided any information about this. In August, there were 60 lakh pre-bookings booked for the first phase. The phone costs Rs 1500 and the company claims that the money will be refunded after returning the phone after 3 years. One Mistake And Jio Will Be Closed From The Free Call! One mistake and Jio will be closed from the free call! Reliance Jio Letest some tariff plan Reliance Jio is in the process of reinforcing unlimited calls. For this, Jio is monitoring his client's call. If the company feels that there is no commercial activity from your Jio number or if Geo numbers are being used for fraud, then the company will stop the unlimited calling facility on your number. 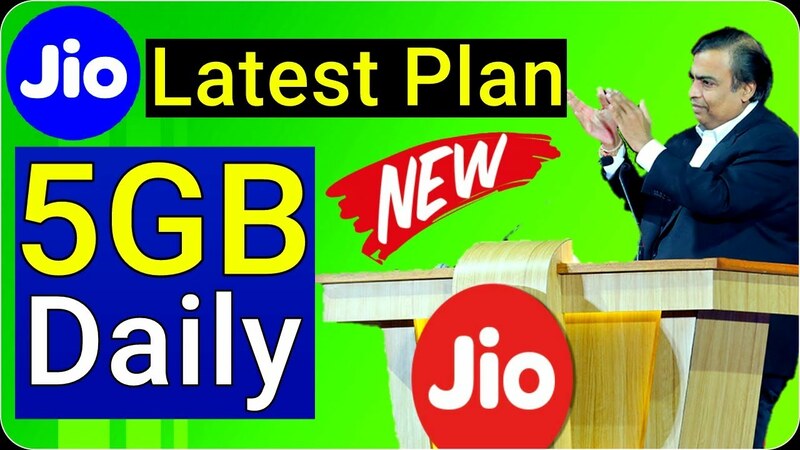 Reliance Jio New Recharge Plane: Reliance Jio has come with a new set of Dhan Dhana Dhan plans which will cost more than the previous plans but will still continue with similar validity periods. These plans will still entail the unlimited internet packs with a prescribed FUP. These new plans have been put in effect from October 19. Earlier this month, Reliance Jio launched a 100 per cent cashback scheme on the Rs 399 plan. The company also promised a new list of data packs once the Diwali offer ends. The plan that was previously available for Rs 399 but now the user will have to shed Rs 459 for the same plan. The plan will entail a total of 84GB for 84 days for with an upper limit of 1GB per day. 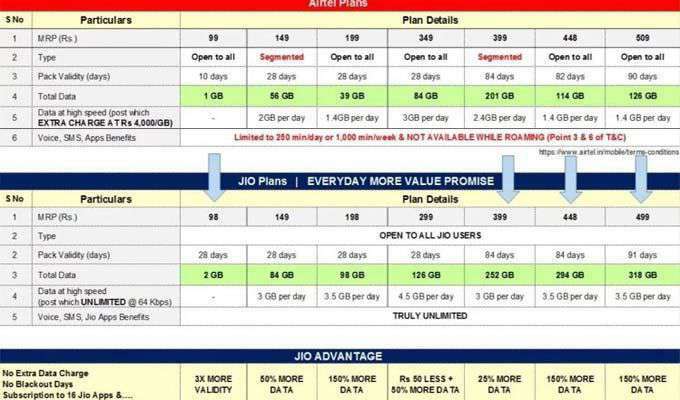 In this plan revision, Reliance Jio has also doubled the data limit on the Rs 149 plan. Data entitlement is being increased to 4 GB instead of the current 2 GB. The validity for the plan will be 28 days for prepaid users and one billing period for postpaid users. Unlimited voice calling and text messages as well as free access to the Jio apps bouquet will remain. Moreover, Reliance Jio will continue to offer the Rs 399 plan with its unlimited benefits for a validity period of 70 days. For subscribers with more data requirements, Jio will offer the Rs 509 plan which offers 2 GB high speed data per day to users for a validity period of 49 days. This comes in addition to unlimited access to other services. For users who need unrestricted high speed data access, Jio has maintained its long-term non-FUP plans. The Rs 999 plan will give 60 GB high speed data for 3 months, whereas Rs 1999 will offer 125 GB unrestricted high speed data for 6 months. 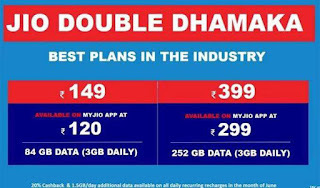 Jio subscribers can also recharge with the annual plan at Rs 4999 which gives unrestricted access to 350 GB high speed data. For small value recharges, Jio has introduced super-affordable daily and weekly packs. Under these plans, a user can get free voice, SMS, unlimited data (0.15 GB daily) for as low as Rs 19 for a day, Rs 52 for a week or Rs 98 for 2 weeks. RELIANCE JIO has released a career notification for the Graduate candidates regarding hiring of Fresher on a handsome pay roll. Reliance Jio has started providing mobile telephony, 4G services and various digital services in India. The aspirants who are seeking for a remarkable job opportunity should apply for RELIANCE JIO Recruitment 2017. Qualification :- Applicants for Jio Recruitment 2017 should have completed Any Graduate/Post Graduate in any discipline to entry level for Freshers for Jio Recruitment 2017. Jio Ki Kar Di Chhutti :- Nokiya Ne Launch Kiya Only 1349 Rupiye Me 4G Smartphone.